[0:00] <a930913> chod: Hmm, that's a point. I'll have a look. [0:00] <tonyhughes> can i paste 9 lines here? [0:00] <tonyhughes> or via pm? [0:00] <a930913> tonyhughes: Not a cron? [0:01] <a930913> tonyhughes: "cat /sys/class/thermal/thermal_zone0/temp >> templog.txt" on cron, no? [0:45] <Tenkawa> so.. did anyone see my earlier question? [0:45] <[Saint]> I suspect many people did. [0:45] <[Saint]> Don't confuse not getting an answer with no one seeing the question. [0:49] <[Saint]> I know. I read it earlier. [0:57] <Tenkawa> OpenSys: yeah i figured as much.. you aware of a kernel boot option to force the sleep or even a bus scan? [1:06] <RiXtEr> me llamo es RiXtEr, y tu? [1:31] <[vali]> are RPI images loop mountable? [1:34] <[vali]> uhmm... offset to the ext4 partition? [1:34] <ShiftPlusOne> Any partition, but yes. [1:35] <ShiftPlusOne> multiple ways. I would just create a smaller image and move the files there, but there are ways to shrink them without recreating them. [2:05] <ShiftPlusOne> [Saint], I'd take that. [2:06] <[Saint]> this switch also has a bunch (8, I think) of USB2 ports for network storage - but, I can't say how well they work - never used them. [2:07] <[Saint]> it even (oddly) has firewire I think. [2:07] * [Saint] thought firewire died, but, guesses not. [3:06] <[Saint]> Don't do it! [3:07] <IT_Sean> don't do what? [3:09] <IT_Sean> safety is overrated. [3:19] * IT_Sean notes that that is the Society for the Prevention of Cruelty to Tribbles, 'for anyone asks. [3:21] <[Saint]> Well - it would be, were he not a giant douche. [3:28] <des2> @#%#$ it does. [3:28] <[Saint]> Ohhhhh - self censorship. [3:29] <IT_Sean> alllright you two... point bloody taken. [3:39] <oreth> just got my pi??? raspbian has been installed to an sd card???. is there a "getting started" guide for mac? [3:40] <[Saint]> If the raspbian image is already installed - there's really nothing else to do. [3:40] <[Saint]> Unless you'd like to be more clear about what it is you want to do, or think you want to do, or think you should do, or need to do. [3:58] <tonyhughes> Yay for RasPBX. Home phone calls now ring my mobile, whether im home or not, via SIP on my WiFi or 3G. [4:06] <Armand> One of the guys at work is really interested in the project.. he likes your menu system. [4:07] <tonyhughes> Thats the easy bit! [4:08] <tonyhughes> "Why did you call Tonys cellphone??!?!?!?!" [4:08] <oreth> how do i??? get apt installed on the system? [4:08] <tonyhughes> oreth what OS? [4:09] <Armand> I'm getting a new 'droid soon.. so I'll have some mobile access control with my own servers. [4:10] <tonyhughes> Nice. Android is great. [4:10] <Armand> Can't do .... with an iPony. [5:00] <Schuyler_> What is the maximum current that is safe to power a rev2 with? [5:01] <ShiftPlusOne> Schuyler_, The pi will only take as much current as it needs. [5:01] <Schuyler_> So hooking it to 4.6A is safe? [5:02] <ShiftPlusOne> The currents listed on power supplies is the maximum the supply can provide. Like a table that can hold 200kg doesn't make things on it weight 200kg. [5:02] <ShiftPlusOne> If that makes sense. [5:02] <ShiftPlusOne> As long as I understood your question correctly... yes, a 5V 4.6A supply is great. [5:02] <x29a> Schuyler_: do you have a picture of a PSU that can provide 4.6 amps? [5:03] <Schuyler_> I could take one. It's just a USB hub. [5:04] <x29a> Schuyler_: is the pi powering something else via usb? [5:06] <pksato> 7 port HUB? [5:06] <Schuyler_> Wired keyboard, wireless mouse, wifi dongle. [5:06] <x29a> pksato: yes, howd you know? [5:06] <Schuyler_> x29a: I wasn't worried so much about having enough currenet. More having too much current. [5:06] <x29a> Armand: via that solar panel? [5:07] <Armand> Solar farm, essentially. [5:07] <Schuyler_> Alrighty. Somewhere i had read something about too much current damaging the polyfuse, shorting board, etc. [5:07] <Armand> I'm looking at building capacity for 60 rPi. [5:07] <x29a> Armand: doing what? calculating bitcoins? [5:07] <Schuyler_> x29a: Is that something you suggest I check? Or are hubs relatively reliable. [5:08] <ShiftPlusOne> The polyfuse shorting the board at high current would be somewhat ironic. [5:08] <pksato> 500mA per USB port, 4600/500=9.2. I never see 9 port USB HUB, 7 (8) port are more close. [5:09] <Schuyler_> Alrighty, thanks x29a and ShiftPlusOne ! [5:10] <pksato> ah... 10 is possible to. [5:11] <Armand> I've got parts in shipping, to create PDUs for my rPi project. [5:12] <Armand> 60x USB ports, prototype boards, screw terminals, etc. [5:38] <ShiftPlusOne> what's your project? [6:28] <pksato> I going to bed, but, pick up strong DRM (digital radio) broadcast from New Zeland (RNZI). [6:43] <Blueness|> how did you smoke them? [6:43] <Blueness|> too much gpio with the wrong voltage? [6:44] <Blueness|> was it over a signal line or vcc? [10:11] <Fhl> really?! woaw. Can you direct me in the right direction, please? [10:13] <Fhl> I had problems with pulseaudio and delay. Is dmix similar? [10:39] <Fhl> Triffid_Hunter: I used rpi-update and now it works wonderfully. Thank you very much. I can have 8 instances of aplay at the same time, which is perfect for what I need. You saved my day, thank you! [11:27] <Fhl> It has the newest firmware and I rebooted twice to make sure that it worked. [11:50] <gordonDrogon> and see if you get an green flash codes when you power it up. [11:54] <irgendwer4711> hi, anyone here, who uses a triac to control somethingt with raspberry? [12:09] <gordonDrogon> irgendwer4711, I've used solid state relays. [12:09] <Fhl> Viper-7, gordonDrogon it was indeed SD corruption. However, I have noe idea why. Is this a common problem? [12:10] <Fhl> or rather, it was image corruption. Fresh image solved the issue. [12:10] <gordonDrogon> who knows. some people see it, some don't. I used to get it very occasionally, but that was when I was overlcocking. stopped overclocking and not had an issue in over 6 months now. [12:10] <gordonDrogon> irgendwer4711, do you mean what part number? [12:11] <irgendwer4711> gordonDrogon: with resistor before SSR? [12:11] <gordonDrogon> irgendwer4711, no. they have one built in. [12:12] <gordonDrogon> they're not cheap, but they are easy to use. [12:23] <gordonDrogon> maybe you're not triggering it correctly. [12:39] <[Saint]> nah - steel wool. [12:42] <[Saint]> Another good way of cleaning pointy/pokey type tools (soldering iron tips/srewdrivers/etc) is a small bucket of sand moistened with machine oil. [12:42] <[Saint]> shank up the sand a few times and BAM - shiny tools. [12:42] <Grievar> uh, machine oil on a soldering iron tip? [12:43] <[Saint]> WHy? the flashpoint is much lower than the soldering iron max temp. [12:43] <[Saint]> it just vapors off. [12:43] <clever> much higher you mean? [12:45] <[Saint]> I wouldn't want to be near any sources of ignition - just for safety - but the worst that would happen is a tiny little puff of flame. [12:45] <[Saint]> The iron can get hot enough to bring the oil past flashpoint, but not hot enough to ignite it. [12:48] <[Saint]> I actually leave all my old screwdrivers that no longer belong to a set in said bucket. No rust for me. [12:48] * [Saint] lives basically right on the Pacific Ocean's doorstep - salt air eats *everything*. [12:49] <[Saint]> that sand/machine oil mix is also really good at sharpening spades/shovels/hand trowels etc. [12:50] <Grievar> wooy: the black stuff is burnt flux btw. The way you avoid getting it is to A) avoid getting flux on your iron B) wipe on sponge as QUICKLY as possible after soldering a joint. [12:51] <[Saint]> My method for that is "stab tip into an egg cup packed with steel wool"
[12:55] <wooy> Well I applied some solder on the tip to make transfering heat easier on the cable joint. [12:56] <gordonDrogon> what make/model is the soldering iron? [12:57] <gordonDrogon> 12w seems somewhat weak IMO. [12:58] <gordonDrogon> you just need a damp sponge to clean the tip. [12:59] <gordonDrogon> and use flox cored solder. [12:59] <gordonDrogon> *flux cored solder. [13:09] <gordonDrogon> it should only take a few quick wipes. [13:09] <gordonDrogon> unless the coating on the tip has been worn off. [13:09] <gordonDrogon> then you need a new tip. [13:10] <gordonDrogon> I've never used any of the 'wool'/metal springy things.... just a sponge. [13:11] <gordonDrogon> it's a bit wordy :) I talk too much! [13:13] <drobban> gordonDrogon: at what temp do you solder? [13:13] <gordonDrogon> is there another unit? [13:14] <gordonDrogon> and it looks better. [13:45] <ChampS666> is there a player for fedora remix which can play 1080p videos? [14:08] <gordonDrogon> now life is fine. I have coffee and a hot freshly made bread-like something. [14:53] <gordonDrogon> Gadgetoid, Ah-Ha... Know anything about the beagleboard? [14:53] <Gadgetoid> gordonDrogon: Next to nothing, why do you ask? [14:54] <gordonDrogon> someone asked me about doing wiringPi for it. [14:57] <JohannesG> my brain short circuited on "horribly user unfriendly"
[14:58] <gordonDrogon> not sure I can be bothered though. [15:20] <Gadgetoid> gordonDrogon: That's shiny! [15:23] <mgottschlag> gordonDrogon: that's an 8080 bus style lcd? [15:23] <mgottschlag> if yet, how timing critical are those? [15:26] <gordonDrogon> mgottschlag, I think so. [15:27] <gordonDrogon> there is a strobe line and a data/register select line. [15:27] <gordonDrogon> additionally )-: There are 2 chip-select lines. each chip does 64x64. 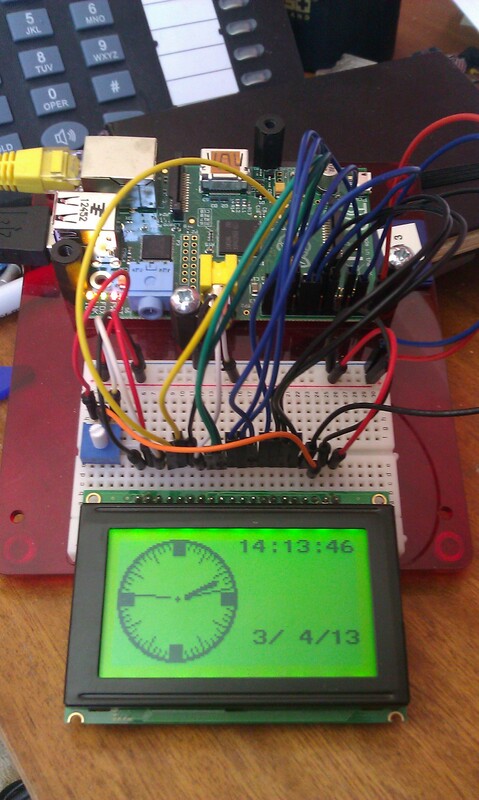 [15:27] <gordonDrogon> needs 12 pins off the Pi. [15:27] <gordonDrogon> I can drive it at just over 100fps. [15:28] <gordonDrogon> I could be much more efficient, but there's no real need. [15:29] <gordonDrogon> that's now in wiringPi..
[15:30] <Gadgetoid> gordonDrogon: Is 2.x up on your git now? [15:31] <gordonDrogon> keep getting other things to do. spent the last few days sorting out my accounts. [15:33] <gordonDrogon> I'm going to test the existing one too - I think there might be some timing issues that 1 or 2 people have reported. [15:33] <gordonDrogon> I was thinking of separating out the peripherals from the 'core' wiringPi stuff too, but I'm not sure what form that might take. [15:34] <gordonDrogon> saw an intersting thing about "copy & paste" programming the other day too - mostly from the arduino world, but I'm seeing in in the Pi works now too - in some of the wiringPi feedback I'm seeing. [15:37] <murphycr> Would anyone know offhand a way to get ls to list files, one per line, with the full path? [15:39] <nid0> so do a find? [15:40] <gordonDrogon> or use locate if you run it. [15:41] <Gadgetoid> I like "tree"
[15:50] <Gadgetoid> Hmm, my Pinout site isn't gaining any traction, drat! [15:58] <rpitin> The first 5 seconds of Smells like teen spirit? [16:20] <rpitin> LTCoin: yeah, same thing is happening in AU, its retirement funds seem to be an easy targets for the pollies at the moment. [17:39] <nkh> Anyone knows some open source dvr application for using on Arm ? [17:40] <nkh> Like what shows multiple security cameras and records them and does stuff like this . [17:42] <nkh> jelly1: is that the name? [17:43] <nkh> jelly1: one of my friends had a real dvr and we couls look into it, we found that runs something named dvrbox and Sofia , don't you know anything about that? [17:43] <nkh> jelly1: is that something commercial ? [17:56] <spacebug^> to increase videoperformance in raspbmc is it sufficient to use raspi-config and overclock use one of those defaults settings ot should I try changing vaules for freq settings regarding h264/etc ? [18:33] <aaa801> gawd dam ddosers, always knocking at my firewlal! [19:35] <oreth> my pi is running super slowly on raspbian. Normally i'd like to run headless, but i just want to check out the desktop. [19:36] <buzzsaw> what about running something like fluxbox and no desktop? [19:37] <gordonDrogon> HazardX, which apt repository - the standard raspbian one? [19:37] <oreth> i just wanted to test out the video capabilities. [19:38] <gordonDrogon> I run xfce4 on my Pi when I run up X - and chromium web browser is ... well, it's slow but surprisingly usable. [19:51] <gordonDrogon> not really - google for 'kiosk' type solutions maybe? [19:53] <oreth> ugh??? when i vnc into my pi it starts a new desktop??? is it possible to vnc into the desktop that is displaying on the monitor? [19:56] <oreth> it's installed with raspbian? [19:59] <gordonDrogon> arve, there are hooks in /etc/network/interfaces designed to do that. [20:00] <gordonDrogon> arve, however I've a funny feeling that Raspbian might have some sort of 'network mangler' that bypasses that stuff - I removed it all on mine and use the standard stuff. [20:03] <gordonDrogon> arve, the other thing you can do is put something in /etc/rc.local - that's run last thing in the boot sequence. [20:06] <gordonDrogon> if the wifi were being kicked off in /etc/network/interfaces then that would be the place - there are 'post-up' scripts that can be run. [20:08] <pagios> hello anyone owning a c920 logitech? [20:34] <arve> now i have to figure out how to launch the browser properly. Seems this thing runs "below" the desktop environment. [20:47] <pagios> anyone tried recording audi with the rpi? [20:48] <IT_Sean> you would need a USB audio capture device. [20:48] <pagios> IT_Sean: can i use the C920 logitech cam? [20:48] <IT_Sean> Has it got a microphone? [20:49] <IT_Sean> that should do. I don't know what software you would use, though. [20:49] <pagios> anyone has got a webcam + mic working guys? [21:09] <kkit> pagios, depends. are you compressing it too? [21:10] <kkit> what format are you using? [21:11] <dv_> it is if you want high quality encodings. realtime, not so much. [21:12] <pagios> dv_: but opus encoding can be done on the rpi? isint it too heavy? [21:15] <dv_> http://speex.org/ says "The Speex codec has been obsoleted by Opus." [21:16] <pagios> hmmm any hardware encoding usb device that can be connected to the rpi? [21:31] <gordonDrogon> Gadgetoid, yes. no. maybe. [21:31] <gordonDrogon> I suspect coincidence actually. He just picked the first 8 regular GPIO's and numbered then 0-7. [21:40] <gordonDrogon> Gadgetoid, lcd drivers for what chip? [21:43] <gordonDrogon> SPI by the looks of it ..
[21:44] <gordonDrogon> ah, that's the chap who did the fritzing diagram for the Pi too. [22:20] <gordonDrogon> can't it work with SPI? [22:43] <michiwend> one option is to use a usb board but maybe there are other boards to use with gpio? [22:44] <pksato> michiwend: search for shield for arduino. [22:46] <monst> Id like to get 4 joysticks with buttons working on a raspberrypi any recommendations? [22:49] <pksato> just need know logic levels differences between arduindo (5V) and rpi (3V3). [22:54] <michiwend> but rpi is able to control 8 channels via GPIO? [22:54] <gordonDrogon> michiwend, it can control 17 easilly. [22:55] <gordonDrogon> ie. cheaper than I can buy the bits individually. [22:55] <gordonDrogon> they're all 5v too. [22:56] <pksato> the big problem is, these modules are poorly documented. [22:56] <gordonDrogon> and badly laid out from what I've seen. [22:56] <gordonDrogon> and what can go wrong. [22:58] <pksato> 17 only using simple transistor drivers. [22:58] <gordonDrogon> sure - go ahead. just remember it's 3.3v output. Use some uln2803's and power the relays separately to the Pi. [22:59] <gordonDrogon> if you're paranoid and want isolated grounds then use opto isolators. [22:59] <gordonDrogon> but relays and uln2803's ought to be fine - but do use a separate PSU for the relays - the Pi can only drive 1 or 2 5v relays. [23:03] <michiwend> gordonDrogon: how about using 3V relay directly with gpio? [23:04] <gordonDrogon> pksato, 5v inputs... that's the main issue with most of the relay boards. [23:05] <gordonDrogon> michiwend, worked it out yet? [23:07] <gordonDrogon> michiwend, indeed. a bit more than the 0.016A avalable per pin..
[23:07] <gordonDrogon> you need a buffer - that's what the uln2803 wil lgive you. [23:07] <gordonDrogon> there are devices you can use directly though. [23:08] <gordonDrogon> http://www.crydom.com/en/products/catalog/c_x.pdf <- ones I've used in the past. [23:08] <gordonDrogon> 5v or 12v. [23:09] <gordonDrogon> it's a darlington transistor array - with built-in limiting resistors and a built-in back emf protection diode too. [23:09] <gordonDrogon> it's designed for exactly this application - driving relays. [23:12] <michiwend> gordonDrogon: any suggestions what relais to use? [23:14] <Gadget-Mac> You might be able to drive them directly from a uln2803 without the relay. [23:14] <gordonDrogon> not sure - you'll need to check the ratings - if they're solenoid valves they might work on AC too. [23:14] <gordonDrogon> yes, but check the current - uln2803 has a max. of 500mA through it. [23:15] <gordonDrogon> I've not driven any of them for a while though, but the ones I used did get a bit warm, but I imagine technolgy might have improved. [23:19] <gordonDrogon> one of mine? [23:20] <gordonDrogon> enjoy - zed time for me. [23:27] <michiwend> ok, thx a lot! [23:34] <linuxstb> Duality: Correct - omxplayer uses the GPU for audio output, and the GPU can only talk to the HDMI or analog audio outputs (afaik). mplayer uses alsa, so will support everything. [23:40] <azeam> linuxstb: there's still no way to get mplayer to use hardware acceleration for video though, right? [23:54] <timb_us> Haha, so I bought a PiFace card from some seller on eBay. New in box, right? I get an email from him two days ago saying he may have mixed up my package and shipped the wrong item to me. [23:56] <timb_us> He emails me, "Send that back please, or I'll sell it to you for $35."